This is a true story about why I don’t listen to podcasts. When I was six, my father moved us from Cleveland to San Diego County, for his new job with a company. At six you’re pretty flexible about moving, and for me it was pretty quick to make new friends (school — so convenient) and my father’s always been pretty sociable. One of the first friends he made was the ‘only other Jew’ at the company, Arthur. To me, Arthur is an uncle whom I absolutely adore. He’s a darling man whom I call one of “My Old Men” and while I don’t see or talk to him as much as I’d like, every time we see each other, it’s family. You understand. Arthur is, however, a bachelor. The jokes about how my father is ‘the man who lives with Arthur’ aside, Uncle Arthur does not have, nor has he ever wanted, children. Somehow, however, my father managed to convince him to babysit me one day. I forget why but I remember that Arthur was worried. How do you entertain a six year old girl? I was not the ‘normal’ girl, of course, not like Arthur expected. I didn’t want to play dolls (they were action figures) and I loved reading. At the time, I was rather obsessed with Robin Hood, and had read and re-read the same few books over and over, so Arthur has a fit of brilliance. The night before I’m coming over, The Adventures of Robin Hood is on TV. 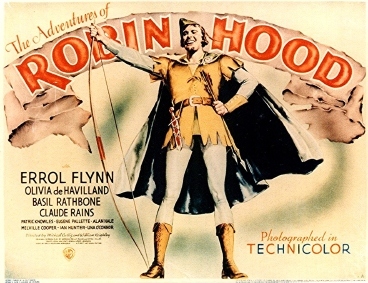 The old movie with Errol Flynn, that was barely in color at all. Arthur pulls out his BetaMax (yes) and records it. But he doesn’t just record it, no, he edits out the commercials and stays up all night on this piddly BetaMax. 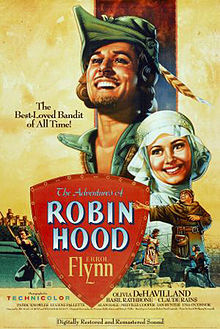 The next day, I come over, we have lunch, he asks me about Robin Hood and if I’ve seen that particular movie. I had not, so he puts it on for me. I watch it for about five minutes and then do what I always do. I start playing with the GI Joes, I clamber around his stairwell (he has a duplex, we did not, I was always fascinated by it), I look at my comics, and so on. And Arthur was pissed off. I can’t blame him. Now, thirty years later, I’m rather embarrassed about it. He remembers being pissed off and snide to me afterwards, I just remember him asking me what I thought of the movie. And I told him all the differences between the movie and the books, as well as the movie I had seen (and not the Disney one, which I discounted out of hand by it being Disney and using anthropomorphized animals, though at the time I just said ‘silly animals’). When my dad came to pick me up, Arthur grabbed his ear, metaphorically, and told him that I had a talent for multiprocessing. I could learn and listen to multiple things at once. This should be cherished, encouraged, and let to grow. Arthur saw through the hyperactive kid and saw talent. This all goes to explain why I have a problem with learning by watching. And this is not something people always grasp when I tell them that story. Clearly I can multiprocess, right? Right, so I can listen to music or the TV or the radio while working, and magically pick out the important bits. I’m a little in love with my DVR because I will tune in, rewind, watch again, and get even more out of it. I’m perpetually watching something, or listening to something, while working and, thus, learning more. But what I don’t do, what I can’t do, is tune in and out like that when I’m in a class, lecture, or WordCamp presentation. Yeah, I said it. If you see me at a WordCamp, I don’t generally have my laptop. If I have anything, it’s a notebook where I’m furiously writing notes, by hand, about idea the session gave me. But I don’t introduce Twitter or Facebook or even code to any of that, because when I’m learning something directly, I need to concentrate on that and only that. Podcasts are the same way for me. Ditto WPTV. I have to sit and listen (or watch) whatever it is in order to get anything useful out of it. I can’t listen to it in the background because there’s too much to take in and not enough fluff. Even when I was commuting an hour each way, I couldn’t do it. At best, I can listen on the treadmill, but every summer I listen to the baseball games, so that gives me an hour a day in the winter… and I usually want to listen to some loud, fast, Grrl Rock, to get me in a running mood. Ironically, I can do it for entertainment pretty easily. I love to listen to Wait Wait Don’t Tell Me, and a bunch of old-time Radio, just like I watch TV. But a podcast and a lecture and a WordCamp talk? They’re like a book. See a book, I have to invent everything. What color is the shirt? What accent does that character have? How would he stand? How does she smile? When they hug, how do they stand? Everything you see on the TV and hear on the radio, I come up with in my head. I paint a picture, so my brain is active and busy and all those levels that just a TV show can’t contain, I create. When I listen to a podcast, it’s something that triggers me on multiple levels. What did he mean by that phrasing? Why would we use this code there? Hey, I could totally tweak my site with that! Hence the notes I take at a WordCamp session. And that’s why I don’t listen to your podcasts. Look, I know that sounds weird, but in order to listen to the podcasts, I need to carve out twice the play time to listen, make notes, rewind, listen again, check the code you’re talking about on a site, and so on. And as much as I love everyone and their cool ideas, I tend to put that to the side unless the write-up of your session. When I was in school, I was in school and I was serious about it. When I go to a WordCamp, I’m in Camp and I’m serious about it. That’s the only way I can get all my gears to process your podcasts. As good as I am with a lot of stimulation, I know when I need to not have that extra stuff going on. A WordCamp has enough of it so I tune it out to learn, ditto a class. But a Podcast is so, so hard to sit and watch that one thing. I can’t learn without something to tune out, so I can concentrate on you and you alone.